← How do Holy Ghost Guides Serve in the Spiritual War Effort? The bowls have all been poured out. Like all things from Father, a progression takes place. Nothing happens quickly. And some things might not occur in the exact order of the pouring out of the seven bowls of Father’s anger. This is because all things are interconnected with bringing what needs to be done to a climax before the great earthquake occurs. It is at that point, that of the seventh bowl that Michael will sound the trumpet for the cup of wrath to be administered. 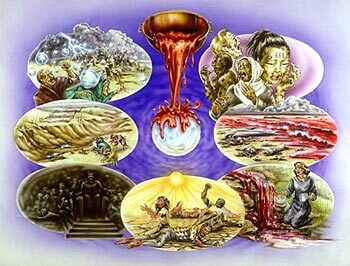 Then I heard a loud voice from the sanctuary saying to the seven angels, “Go and pour out the seven bowls of God’s wrath on the earth.” The first went and poured out his bowl on the earth, and severely painful sores broke out on the people who had the mark of the beast and who worshiped his image. All will have the mark, but those that worship the image of the beast will experience the severe pain associated with Father’s anger. To avoid the mark, it would require leaving the fleshly plane. To remain clean in Father’s eyes until your imperfect vessels are shed for your spiritual bodies, you must not worship anyone but Father and remain obedient. The second poured out his bowl into the sea. It turned to blood like a dead man’s, and all life in the sea died. The fourth poured out his bowl on the sun. He was given the power to burn people with fire, and people were burned by the intense heat. So they blasphemed the name of God who had the power over these plagues, and they did not repent and give Him glory. Father holds the power of the bowls of wrath, but those who are of Dawn Lucifer’s tribe will not repent nor give glory to the only One that can save them from what plagues them. The fifth poured out his bowl on the throne of the beast, and his kingdom was plunged into darkness. People gnawed their tongues from pain and blasphemed the God of heaven because of their pains and their sores, yet they did not repent of their actions. So they assembled them at the place called in Hebrew Armageddon. The islands will all go under water and the mountains will crumble to dust as the cities are destroyed from the enormous earthquake. The “great city” is that of Dawn Lucifer’s false empire that will be split into three parts. His Babylon the Great will receive no less of Father’s fierce anger. False religion will become nonexistent as the cup of wrath’s execution devastates all life on this planet. One part is Dawn Lucifer’s throne devastated. The second part is that of false religion. The third part is that of the earthly nations that have followed Dawn Lucifer’s way of life. All opposed to the truth. All continuing to blaspheme Father with their dying breath. This entry was posted in Angels / Holy Angels, Bowls, Judgement, Wrath and tagged Bowls of Wrath, Judgment, Prophecy. Bookmark the permalink.